What? Did he say November gardening? Odd as it no doubt sounds to some, for those who love gardening there is a lot to do at the onset of winter. 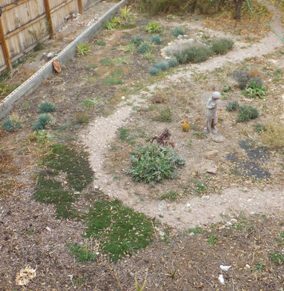 The garden today, November 9, 2012. I’ve been neglecting this blog, so I decided to start a series of monthly gardening posts to share what I’m doing as the calendar pages turn. Will I keep up with this? We’ll see. The first frost here was a month ago, so the vegetable garden and tender plants are a thing of the past. 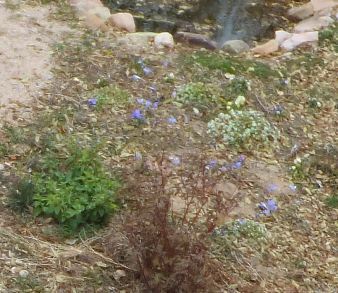 There are still things blooming, though: Crocus speciosus, sweet alyssum (Lobularia), violas, and Shenandoah petunias. Although the frost was a month ago, it hasn’t really been very cold yet: nightly lows around 30 degrees F. There’s a storm coming through this weekend, with temperatures expected to get down to 20 or below, so it’s time to attend to some winter preparations: turn off the solar pump for the pond and bring in the dianthus seedlings still out on the back deck. They are hardy perennials, of course, but they are young plants and will do better indoors during the cold of winter. 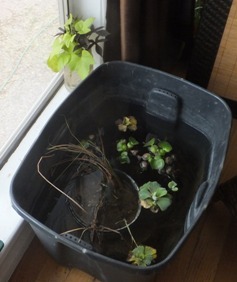 Last month I brought some things indoors to overwinter: pond plants, and cuttings from Ipomoea vines that I grow in containers during the summer. The cuttings have rooted in a jar of water and are now ready for potting up. seedlings from garden-collected seeds of Dianthus ‘Firewitch’ and ‘Arctic Fire’, started late this summer. On weeks when the weather is relatively mild, November is also a good time for digging new beds and taking on small projects outdoors. I have an old sagging table that I want to replace with a home-made potting bench of cinderblocks and particle board. In preparation, I’ll be taking some bricks from an area where they aren’t wanted and making a sort of foundation for the new work bench. Overwintering pondplants and Ipomoea cuttings. This is also the month of the Scottish Rock Garden Club’s seed exchange. The list should be posted soon now, and I can’t wait to dive in and see what’s available. I’ve already received and planted seeds from the Aril Society International seed exchange, and am looking forward to the exchanges of the North American Rock Garden Society, Species Iris Group of North America, and British Iris Society, which take place around Christmas. I’m also pondering what plants I want to start next year. The Thompson & Morgan seed catalog has arrived, and others will follow in December and January. A friend on an iris discussion group suggested planting sweet peas in flower beds, as they are nitrogren fixers. I think I will try that, so have been poking around catalogs and web sites to check out different varieties. I also seem to be developing a fondness for growing cactus and succulents from seed. Among the cacti, I’m mostly interested in hardy kinds I can grow outdoors here, particularly New Mexico natives. Contemplating succulents, I want to grow more Lithops, try some Conophytum, and maybe Adenium obesum and Pachypodium saundersii. Oh, and Euphorbia obesa. Did I mention Haworthias? Well then. Spending some time at CactusStore.com and the website of Mesa Garden in Belen, trying to converge on a shopping list. I’m mulling over a few things I learned this year. 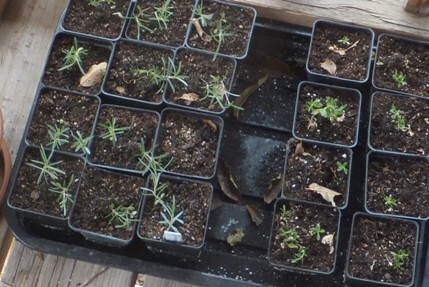 When starting seedlings, it seems to be better to start early: January and early February. I’m confident I can raise husky plants that way, better able to survive transplanting in New Mexico’s dry and windy spring weather. I also had success this year in planting new irises in pots–just the ones with very small rhizomes that need a more controlled environment than they can get in the open garden. I did this with a few dwarf species and some very small aril rhizomes this year, and it seems to have been good for them.